Each year the flu kills thousands of people and affects millions around the world. So it’s important that public health officials and health professionals learn about outbreaks as quickly as possible. In 2008 we launched Google Flu Trends in the U.S., using aggregate web searches to indicate when and where influenza was striking in real time. These models nicely complement other survey systems—they’re more fine-grained geographically, and they’re typically more immediate, up to 1-2 weeks ahead of traditional methods such as the CDC’s official reports. They can also be incredibly helpful for countries that don’t have official flu tracking. Since launching, we’ve expanded Flu Trends to cover 29 countries, and launched Dengue Trends in 10 countries. The original model performed surprisingly well despite its simplicity. It was retrained just once per year, and typically used only the 50 to 300 queries that produced the best estimates for prior seasons. We then left it to perform through the new season and evaluated it at the end. It didn’t use the official CDC data for estimation during the season—only in the initial training. In the 2012/2013 season, we significantly overpredicted compared to the CDC’s reported U.S. flu levels. We investigated and in the 2013/2014 season launched a retrained model (still using the original method). It performed within the historic range, but we wondered: could we do even better? Could we improve the accuracy significantly with a more robust model that learns continuously from official flu data? So for the 2014/2015 season, we’re launching a new Flu Trends model in the U.S. that—like many of the best performing methods [1, 2, 3] in the literature—takes official CDC flu data into account as the flu season progresses. We’ll publish the details in a technical paper soon. We look forward to seeing how the new model performs in 2014/2015 and whether this method could be extended to other countries. As we’ve said since 2009, "This system is not designed to be a replacement for traditional surveillance networks or supplant the need for laboratory-based diagnoses and surveillance." But we do hope it can help alert health professionals to outbreaks early, and in areas without traditional monitoring, and give us all better odds against the flu. We believe that RAPPOR has the potential to be applied for a number of different purposes, so we're making it freely available for all to use. We'll continue development of RAPPOR as a standalone open-source project so that anybody can inspect and test its reporting and analysis mechanisms, and help develop the technology. We’ve written up the technical details of RAPPOR in a report that will be published next week at the ACM Conference on Computer and Communications Security. As anybody who has tried to use a smartphone to photograph a dimly lit scene knows, the resulting pictures are often blurry or full of random variations in brightness from pixel to pixel, known as image noise. Equally frustrating are smartphone photographs of scenes where there is a large range of brightness levels, such as a family photo backlit by a bright sky. In high dynamic range (HDR) situations like this, photographs will either come out with an overexposed sky (turning it white) or an underexposed family (turning them into silhouettes). HDR+ is a feature in the Google Camera app for Nexus 5 and Nexus 6 that uses computational photography to help you take better pictures in these common situations. When you press the shutter button, HDR+ actually captures a rapid burst of pictures, then quickly combines them into one. This improves results in both low-light and high dynamic range situations. Below we delve into each case and describe how HDR+ works to produce a better picture. The camera on a smartphone has a small lens, meaning that it doesn't gather much light. If a scene is dimly lit, the resulting photograph will contain image noise. One solution is to lengthen the exposure time - how long the sensor chip collects light. This reduces noise, but since it's hard to hold a smartphone perfectly steady, long exposures have the unwanted side effect of blurring the shot. Devices with optical image stabilization (OIS) sense this "camera shake” and shift the lens rapidly to compensate. This allows longer exposures with less blur, but it can’t help with really dark scenes. HDR+ addresses this problem by taking a burst of shots with short exposure times, aligning them algorithmically, and replacing each pixel with the average color at that position across all the shots. Averaging multiple shots reduces noise, and using short exposures reduces blur. HDR+ also begins the alignment process by choosing the sharpest single shot from the burst. Astronomers call this lucky imaging, a technique used to reduce the blurring of images caused by Earth's shimmering atmosphere. Another limitation of smartphone cameras is that their sensor chips have small pixels. This limits the camera's dynamic range, which refers to the span between the brightest highlight that doesn't blow out (turn white) and the darkest shadow that doesn't look black. One solution is to capture a sequence of pictures with different exposure times (sometimes called bracketing), then align and blend the images together. Unfortunately, bracketing causes parts of the long-exposure image to blow out and parts of the short-exposure image to be noisy. This makes alignment hard, leading to ghosts, double images, and other artifacts. However, bracketing is not actually necessary; one can use the same exposure time in every shot. By using a short exposure HDR+ avoids blowing out highlights, and by combining enough shots it reduces noise in the shadows. This enables the software to boost the brightness of shadows, saving both the subject and the sky, as shown in the example below. And since all the shots look similar, alignment is robust; you won’t see ghosts or double images in HDR+ images, as one sometimes sees with other HDR software. Our last example illustrates all three of the problems we’ve talked about - high dynamic range, low light, and camera shake. 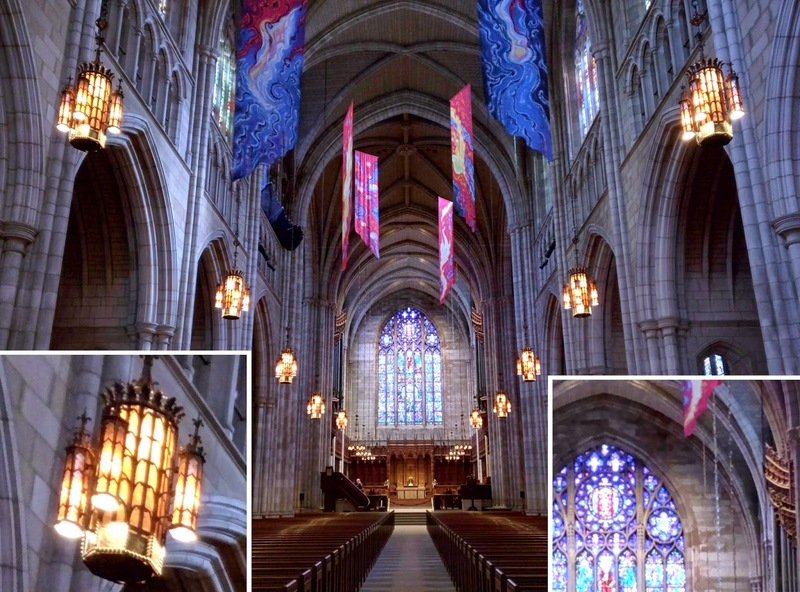 With HDR+ off, a photo of Princeton University Chapel (shown below) taken with Nexus 6 chooses a relatively long 1/12 second exposure. Although optical image stabilization reduces camera shake, this is a long time to hold a camera still, so the image is slightly blurry. Since the scene was very dark, the walls are noisy despite the long exposure. Therefore, strong denoising is applied, causing smearing (below, left inset image). Finally, because the scene also has high dynamic range, the window at the end of the nave is blown out (below, right inset image), and the side arches are lost in darkness. HDR+ mode performs better on all three problems, as seen in the image below: the chandelier at left is cleaner and sharper, the window is no longer blown out, there is more detail in the side arches, and since a burst of shots are captured and the software begins alignment by choosing the sharpest shot in the burst (lucky imaging), the resulting picture is sharp. Here's an album containing these comparisons and others as high-resolution images. 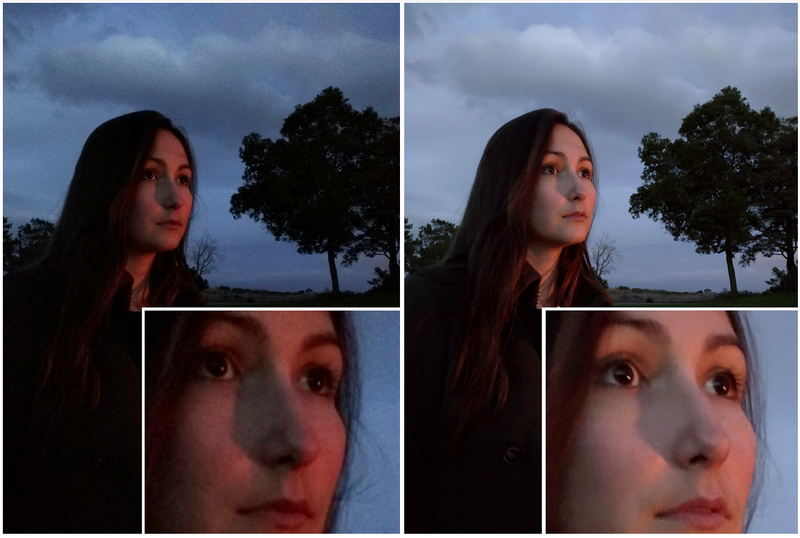 For each scene in the album there is a pair of images captured by Nexus 6; the first was was taken with HDR+ off, and the second with HDR+ on. Capturing a burst in HDR+ mode takes between 1/3 second and 1 second, depending on how dark the scene is. During this time you'll see a circle animating on the screen (left image below). Try to hold still until it finishes. The combining step also takes time, so if you scroll to the camera roll right after taking the shot, you'll see a thumbnail image and a progress bar (right image below). When the bar reaches 100%, your HDR+ picture is ready. Should you leave HDR+ mode on? We do. The only times we turn it off are for fast-moving sports, because HDR+ pictures take longer to capture than a single shot, or for scenes that are so dark we need the flash. But before you turn off HDR+ for these action shots or super-dark scenes, give it a try; we think you'll be surprised how well it works! At this time HDR+ is available only on Nexus 5 and Nexus 6, as part of the Google Camera app. Since 2009, Google’s CS4HS (Computer Science for High School) grant program has connected more than 12,000 computer science (CS) teachers with skills and resources to teach CS in fun and relevant ways. An estimated 600,000 students have been impacted by the teachers who have completed CS4HS professional development workshops so far. Through annual grants, nearly 230 colleges and universities have hosted professional development workshops worldwide. Grantees use the funds to develop CS curriculum and professional development workshops tailored for local middle and high school teachers. These workshops expose teachers to CS curriculum using real-world applications that spark students’ curiosity. As feedback from those teachers rolls in, we want to share some highlights from what we’ve learned so far. More than half of participants said they would use “most” or “all” of the activities or resources presented during their workshop. In 2014 the number of teachers who took part in a CS4HS professional development workshop increased by 50%, primarily due to the funding of multiple MOOCs. Just 53% of participants said they felt a sense of community among the other workshop participants. Research by Joyce & Showers (2002) and Wiske, Stone, & Levinson (1993) shows that peer-to-peer professional development, along with ongoing support, helps teachers implement new content, retain skills, and create lasting change. We’ll explore new ways to build community among participants as we plan future workshops. 83% of participants reported being Caucasian, which is consistent with the current demographics of CS educators. This indicates a need to increase efforts in diversifying the CS teacher population. Outcome measures show us that the most knowledge gains were among teachers who had no prior experience teaching CS or participating in CS professional development -- a population that made up just 30% of participants. While we see that the workshops are meeting a need, there remains an opportunity to develop materials geared toward more experienced CS teachers while also encouraging more new teachers to participate. We know there are many challenges to overcome to improve the state of CS teacher professional development. We look forward to sharing new ideas for working in partnership with the CS education community to help address those challenges, in particular by helping more teachers teach computer science. Computer Science without a computer during a CS Unplugged activity. Much of Google’s work on language, speech, translation, and visual processing relies on machine learning, where we construct and apply learning algorithms that make use of labeled data in order to make predictions for new data. What if you could leverage machine learning algorithms to learn patterns in your spreadsheet data, automatically build a model, and infer unknown values? 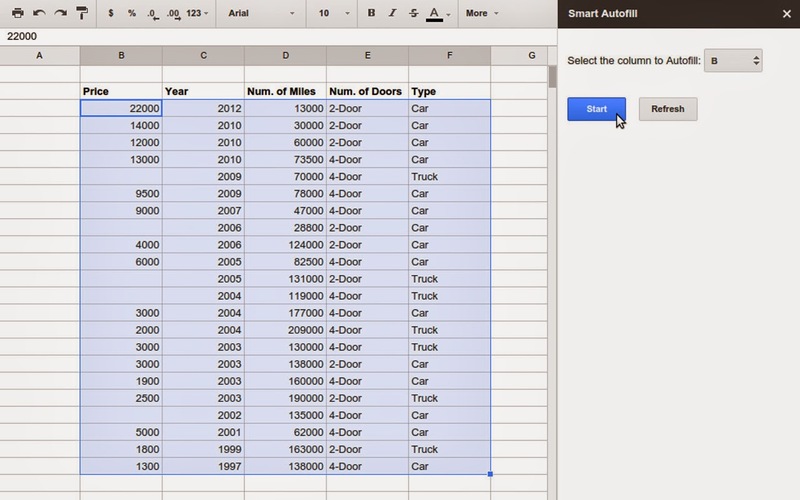 You can now use machine learning to make predictions in Google Sheets with the newly launched Smart Autofill Add-on. With a single click, Smart Autofill predicts the missing values of a partially filled column in your spreadsheet by using the data of other related columns. Smart Autofill uses the non-missing data to learn patterns and differs from the standard "Auto-fill" feature of Sheets, which attempts to fill in only simple patterns that it already knows (e.g. calendar dates, days of the week, ordered numbers). As an example, in the screenshots below, we give four very simple characteristics of used vehicles (year, number of miles, number of doors, and type: car or truck) as well as the price for some of the vehicles. 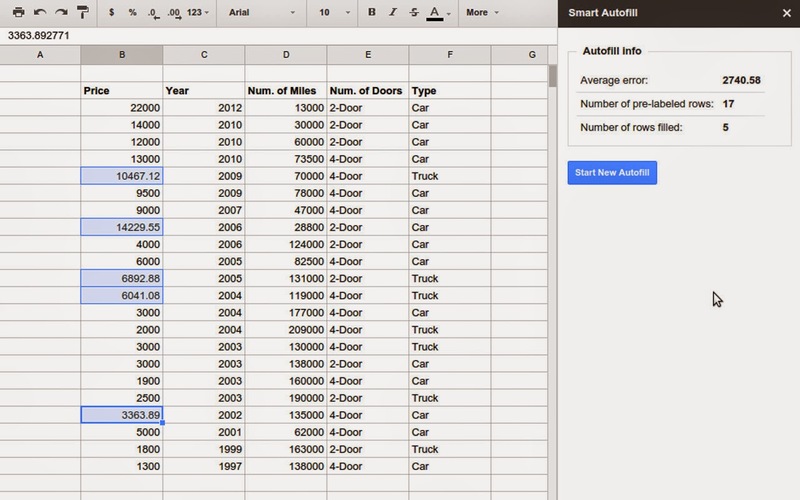 Since the prices are probably correlated with the characteristics of the vehicle, we can use Smart Autofill to estimate what the missing prices should be. The rows that do contain a price will be used as examples to learn from in order to fill in the rows with a missing price. Smart Autofill uses Google's cloud-based machine learning service Prediction API, which trains several linear as well as non-linear classification and regression models. The best model is automatically chosen for your problem by finding the one with the smallest misclassification error (for categorical data) or root-mean-squared error (for numeric data) calculated by using cross-validation on the labeled (non-empty) set of examples. To use Smart Autofill, after following the installation procedure, simply select "Add-ons > Smart Autofill > Start" which will open a sidebar. Select a block of data that includes the column to Autofill and click "Next". Finally, from the selected data, choose a target column to Autofill and click "Start" (Figure 1). Now just sit back as Smart Autofill does its work and fills in the missing values (Figure 2). Figure 1: Highlighting the dataset and selecting the target column. Figure 2: After clicking "Start" a model is trained and applied to automatically fill in the missing values of the target column. Note, the estimated error of the model is reported in the sidebar. An estimate of the error-rate of the model (based on the non-missing data) is shown in the sidebar after the missing values are filled. The accuracy of Smart Autofill (as well as the accuracy of the estimated error) depends on many factors, including the amount and quality of the data provided. While not all datasets will be ideally suited for machine learning, we hope our more in-depth tutorial will provide an idea of the range of problems where Smart Autofill can be effective. You have a spreadsheet that holds the results of a customer survey, but one of the columns (e.g. "overall satisfaction 1-5") has some missing values. If the other columns of the survey can help indicate overall satisfaction then you can try using Smart Autofill to estimate the missing values. You keep a spreadsheet of restaurants that you've visited and their characteristics (type: Italian, ambiance: quiet, cost: $$$, etc.) and whether you enjoyed the restaurant or not. Now you can add the characteristics of new restaurants to your spreadsheet and use Smart Autofill to guess at which ones you might enjoy. The example dataset and more detailed tutorial for the add-on can be found here. We hope you discover new and useful ways to incorporate the predictive power of machine learning with your data. With news article recommendations and endorsements coming from a combination of computers and algorithms, companies that publish and aggregate content, friends and even complete strangers, how do these explanations (i.e. why the articles are shown to you, which we call “annotations”) affect users' selections of what to read? Given the ubiquity of online social annotations in news dissemination, it is surprising how little is known about how users respond to these annotations, and how to offer them to users productively. College students are more interested than ever in studying computer science. There has been an unprecedented increase in enrollment in Computer Science undergraduate programs over the past six years. Harvard University’s popular introductory CS course CS50 has recently claimed the spot as the most enrolled course on campus. An astounding 50% of Harvey Mudd’s graduates received engineering degrees this year. However, while the overall number of students in introductory computer science courses continue to climb, the number of students who go on to complete undergraduate degrees in this field, particularly among women and under-represented minorities, does not match this increase in individual course enrollment (2013 Taulbee Survey). Recent findings show that while students may begin a CS degree program, retaining students after their first year remains an issue. Research indicates that one of the strongest factors in the retention of students in undergraduate CS degrees is early exposure to engaging courses and course material, such as high quality assignments that are meaningful and relevant to the student’s life or classroom activities that encourage student-to-student interaction. When an instructor or department imbeds these practices into the introductory CS classroom, students remain excited about CS and are more likely to complete their undergraduate CS degree. At Google we believe in the importance of preparing the next generation of computer scientists. To this end, we’ve created the CS Engagement Small Grants Program to support educators teaching introductory computer science courses in reaching their engagement and retention goals. We’ll give unrestricted gifts of $5,000 to the selected applicants’ universities, towards the execution of engaging CS1 or CS2 courses in the 2014-2015 school year. We encourage educators who are teaching CS1 and CS2 courses at the post-secondary level to apply to the Google CS Engagement Small Grants Program. Applications will be accepted through November 15, 2014 and will be evaluated on an ongoing basis. If you’re interested in applying, please check out the Call for Proposals.